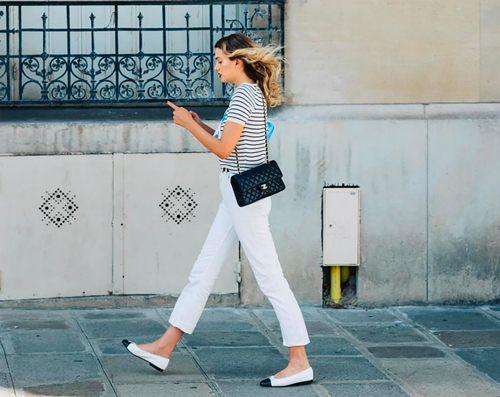 French chic was on full display this past week, and this street style pic demonstrates how we can easily import that je ne sais quoi into our own wardrobes. Put simply: it's all about the classics! Let's start with the staple striped t-shirt: a short sleeve version looks fresher this summer, such as the one above by Splendid (on sale!). I also like these from Anine Bing, Kule, and H&M. Crisp white jeans always work, day and night, especially these flattering styles from Frame, AG, and Barbara Casasola. A quilted Chanel bag and ballerina flats are timelessly chic. J.Crew's summer-friendly woven shoes are spot-on (i.e., equally elegant!) and wallet-friendly. Voila! I've been vacillating between the white/navy and black versions of those flats for a couple weeks. Looks like I need the two-tone!